The crackling of wood burning and the smell of fresh wood smoke is enjoyed by many and you can too, with a fire pit or outdoor fireplace from The Hardscape Center. A fire pit is the perfect way to finish a patio or outdoor seating area at your Richmond, VA home. A fire pit can bring friends and family together or provide the perfect romantic setting for you and your loved one. Fire tends to draw people together and leave them happy and relaxed. 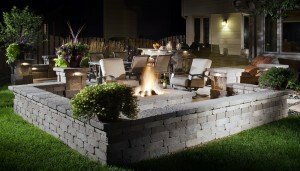 As a premiere supplier of fire pits and outdoor fireplaces in Richmond, VA, we can sell you the materials you need to make your backyard dream a reality. We also offer full service design and installation of fire pits and fireplaces so you can relax while we do the work at your Richmond, VA home. No matter the route you take to getting your project done, or style you choose, we can help make your enjoyment of the outdoors complete.